Extra Give: Caricatures for a cause! Donate to PCA&D here on Friday November 18! Tomorrow is the Extra Give! 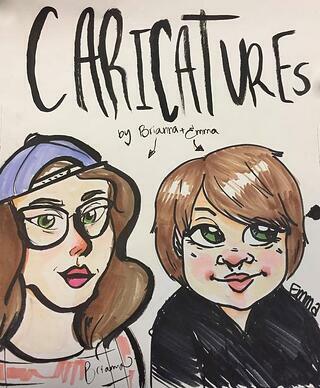 PCA&D Student Council Represenatives Emma Leadem and Brianna Soucheck will be doing caricatures at the ExtraGive party hosted by Benchmark Construction at the Ware Center from 5 - 8 pm. It’s free and open to the public! Benchmark Construction and MU's Ware Center are holding this event to celebrate the and support local non-profits on the largest day of giving in Lancaster County. Pennsylvania College of Art & Design willbe one of 22 local non-profits there. Local wine and brews, appetizers & hors d'oeuvres provided by Sodexo, and music by Music for Everyone and Ben and Joe will accompany the excitement. PCA&D's Pop-Up Print Shop will also be at the party, creating posters and silkscreening T-ships with PCA&D adjunct instructor Becky Blosser's PCA&D print designed especially for the ExtraGive! Donate $50 for a limited edition print! The ExtraGive is Lancaster County's largest giving event, with over $6 million raised last year in 24 hours. Check out https://extragive.org/ for more information on the event. The minimum gift for the Extra Give is only $25, and beginning at 12:01 am Friday morning you can make a gift in support of PCA&D via this link https://extragive.org//designee/pennsylvania-college-of-art-design and track how many donations we receive. Each gift makes PCA&D eligible to receive a portion of the stretch pool of $300,000, as well as $50,000 in available prizes. Visit our Pop-Up Print shop at the Benchmark Construction's Happy Hour giving event at the Ware Center tomorrow night 5-8 p.m. over 20 organizations will be at the event, along with live music and activities. In addition, Student Council representatives Emma Leadem and Brianna Soucheck will be doing caricatures. Last year PCA&D raised $4,750, including gifts from 17 staff members, 6 faculty members and 3 alumni. On November 18, 2016 donations will be accepted from 12 midnight - 11:59 p.m. as part of Lancaster County's largest day of online giving. On that day, every dollar donated will be stretched by at least $300,000 from the Lancaster County Community Foundation, the event's presenting sponsor Rodgers & Associates, and generous community partners, to support non-profit organizations in our community!